The Airlock symbol designates areas that exit into space. It is seen around Escape Pod locations, in Hangars, and near Umbilicals. The emblem is a warning that a zero-gravity environment is present just beyond. The Armory emblem is symbolized by an explosion. This symbol is also used by the UNSC for any weaponry-related areas such as the Firing Control and weapon storage areas. The bridge of a station or vessel is it's control center. For the UNSC, it is a military command center and it's emblem is that of a star. A rest area for off-duty personnel, an area designated as a Commons area usually has some plants and trees, benches for relaxing and in the case of an orbital station, a view of the stars. The symbol for the Commons area is a coniferous tree. The Commons Blue area of Cairo Station is not far from the Shipping area on the station's port side. This courtyard is decorated in blue colors, hence it's name. Different areas of the station are designated by either color code or letter/number codes. Another courtyard like Commons Blue with a spectacular view of Earth and space. Both Commons areas are located along the inner ring of the space station. The Hangars are located adjacent to the Commons on the station's outer perimeter. Commons Red is located more centrally, not far from the station's Bridge on the station's port side. These banners, on the walls of the Commons areas contain the emblem of the UNSC as well as the station's name and registry. The Engineering Room aboard the station generates the power for the weapons, namely the MAC cannon, station-keeping thrusters, computers, sensors, and life support. The station's Firing Control Room is located along the central vertical MAC gun slightly below the centerline ring surrounding the MAC. The explosion emblem is the same as for all UNSC weaponry. There are usually several Hangar Bays on board stations and ships. On Cairo Station during the Covenant's attack on Earth, Hangar A-01 was one of the first areas of the station to be infiltrated with Covenant boarders. The hangar is located near the Bridge on the station's port side. Also known as Fighter Bay A.
Cairo Station's Hangar Bay A-02 was also damaged in the Covenant attack on Earth in October 2552. this bay is adjacent to Commons Blue and is located on the port side of Hangar A-01. 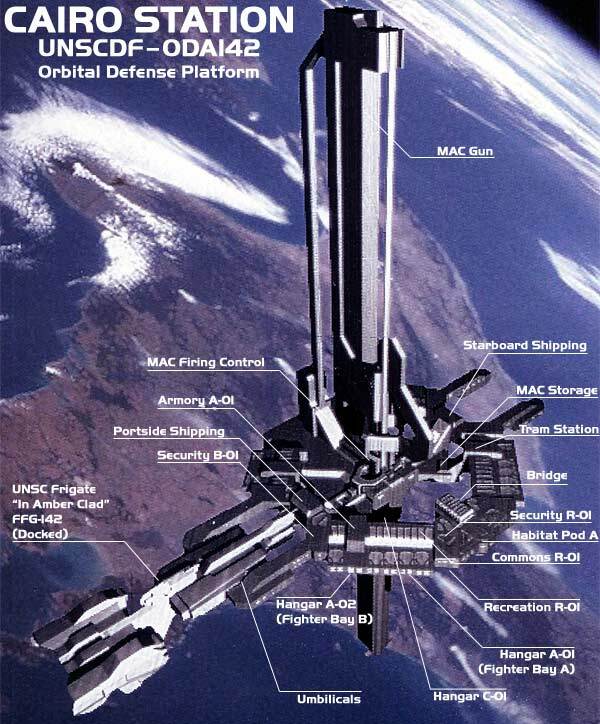 Hangar A-02 has a direct passageway to MAC ammunition storage and the station's Armory. Also Known as Fighter Bay B. Large enough to house Pelican Dropships, Hangars get their emblem from a top view diagram of that craft. Hangar C-01 is located directly under MAC Firing Control. It is from here that Spartan-117 performed an emergency egress with a Covenant bomb during the Covenant attack on Earth. All UNSC stations and ships require medical facilities for the healthcare needs of the crews. The emblem is the cross symbol seen on UNSC med packs. It is standard that all UNSC ships and orbital stations have emergency escape pods in the event of a catastrophe or other situation requiring the immediate evacuation of the facility or vessel. The emblem for the Lifepods is an old-fashioned life preserver. Maintenance areas are designated by the emblem of a wrench. For the relaxation needs of crew, ships and stations have designated recreation areas. The emblem signifying a recreation area is a diagram of a martini. 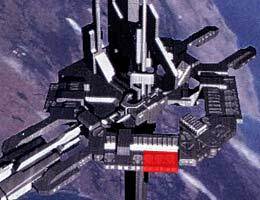 On Cairo Station, Recreation Area R-01 is just outside the Bridge on the station's port side. It contains several large view ports with a view of Earth and has vending machines for snacks and drinks. There are holographic panels displaying information and there are several semi-private vid-phones, used to communicate with Earth. Security Stations are placed in strategic locations and contain a few offices, weapons lockers, and security computers linked to cameras. The security stations aboard Cairo are on the upper level of the outer ring looking down on the Commons areas. The emblem for Security are the initials of the Military Police. The shipping/receiving areas of Cairo Station are located on the extreme port and starboard of the station. Located between the twin forked structures containing the umbilical connects for arriving ships, Shipping contains a massive cargo elevator and container storage. The Shipping emblem is a person carrying a package. The Shipping banner is similar to those found in the Recreation and Commons areas of the station During the Covenant boarding action on Cairo, Spartan-117 was cut off from the MAC Firing Control Room and had to leave through an airlock and travel on the outside of the station in the near-vacuum of Earth's upper atmosphere. He was able to re-enter the station through Portside Shipping. The Starboard Shipping complex is virtually identical to its portside counterpart. It is able to accommodate many UNSC ships, including most frigates and destroyers. For more rapid transfer of personnel to their duty stations, Cairo Station offers a tram system There are two stations between each segment of the station, from portside to central, and from central to starboard. Tram Station B-01 is located near the Umbilicals on the station's portside Shipping complex. The emblem for the Trams is a front view diagram of the tram car. Tram station R-01 is near the entrance to the station's bridge. The tram on the port side of the station passes over the armory and the Red and Blue Commons areas. Umbilicals are located on both sides of Cairo Station. They are docking areas for both the boarding and disembarking of crew from UNSC ships. The Umbilicals contain personnel airlocks as well as electrical, computer and atmospheric connectors. The emblem is the UNSC airlock symbol; a person floating in null gravity. This caution sign is the standard UNSC emblem for weaponry. It is displayed on weapons lockers, armories, and Firing Control areas. The symbol for bio-hazardous material is displayed on crates and storage areas containing dangerous biological compounds. This emergency placard is displayed when a general caution is warranted. This placard is found where the risk of electrical shock is extremely harmful. Found on conduits, electrical rooms, engineering spaces, etc. This emblem is more prominently found on stations such as Cairo, or the Reach MAC arrays. It indicates a danger due to the presence of an intense magnetic field. Ordnance such as the MAC rounds bear this emblem as well. Radioactive materials bear this mark, as do engineering spaces near ships' and stations' fusion cores. Present wherever there's a danger of radiation exposure. This is an alternate general emergency sign. Located near controls where either an authorized operator is required or where danger is high. This is a symbol shown in areas containing noisy machinery or weaponry. This mark requires the use of hearing protection gear. Caution sign placed in areas where the risk of electrical shock is dangerously high. Sign used aboard stations and vessels indicating a staircase. Notes: Some of the locations indicated on Cairo Station are my own speculation and are noted as such. The emblem for the Infirmary is my interpretation of a UNSC medical emblem. It's based on the cross emblem used on the Halo 1 medpacks. All graphics were painstakingly hand-drawn from screenshots using Adobe Illustrator.